Description (from front flap): Whether they're old dogs or hot dogs, they're all good dogs. 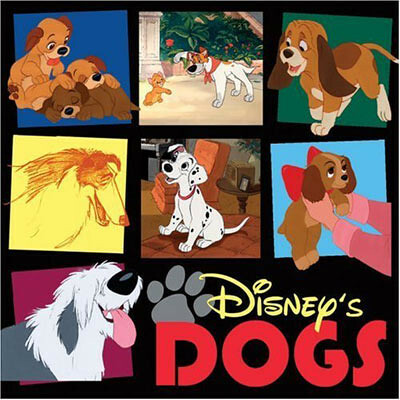 Conceived by the Disney Animation Research Library, Disney's Dogs is a barking good look at the art produced throughout the more than seventy-five-year history of the Disney dog. Disney's Dogs begins with early images of Pluto from the nineteen-thirties and forties. Then it's on to all one hundred and one Dalmatians, the "hound" part of The Fox and the Hound, Oliver and Company, and Lady and the Tramp. There are also canine sidekicks who have found a place in our hearts, including Bruno from Cinderella, Nana from Peter Pan, Toby from The Great Mouse Detective, Percy from Pocahontas, Little Brother from Mulan, and Max from The Little Mermaid. And the lovable Goof--Mickey's best pal. Goofy--is shown from his earliest incarnations to his latest misadventures. Disney's Dogs also showcases dogs that are not really "traditional," such as Stitch from Lilo & Stitch, the footstool in Beauty and the Beast, the carpet from Aladdin, Slinky Dog from Toy Story, and Zero from Tim Burton's Nightmare Before Christmas. And finally, Disney's newest dog--Bolt!--makes his debut. From full-page images to whimsical thumbnails, the book includes conceptual artwork, model sheets, animation, and final-frame images of Disney's mangy mutts and cocky canines. This is one book you won't be able to keep your paws off! GMD mention: Pages 106 and 107 have concept art of Toby the basset hound. Copyright © 2008 by Disney Enterprises Inc.